The DH Team are almost finished the next edition in our webisode series! (You can watch them on our YouTube channel!) We've had some questions around the process. Our Lead Animator Alex ran us through the animation process in our last update, but how about the creation of all those assets? We rounded up our Illustrator Chris to share some insight. CHRIS: To me, Double Happy has only ever been an ambiguous label on an equally ambiguous drawer beside Troy's desk for as long as I've been with the company. Until now, I've been imagining little back-stories as to what it might actually be; my curiosity and imagination piqued at the purportedly double-strength source of joy. Surprisingly enough I was not far from the mark in my musings. 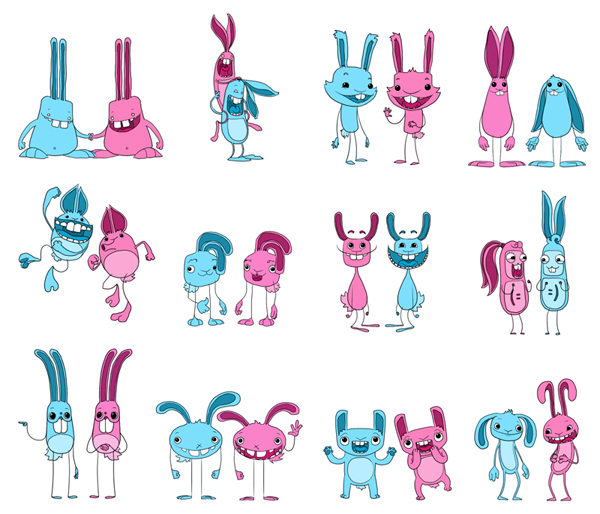 Before I myself was able to unlock the joys of DH, I was privileged to see fellow Monkey's working away at it's various themes, so after tying some loose ends on another project I was given the job of character concepts for the Double Happy Rabbits, who are the lovable and somewhat oblivious protagonists of the game. I made a point not to look at them in any depth so as to not be influenced by any other artist's design. I figured that in the end, if we were all stumbling upon similar designs then that would be a positive underlying point of common ground to draw upon (excuse the pun). I churned out a baker's dozen or so, and left it to the head-monkeys to mull over. These were the original concepts. My design process was influenced by a number of things; one being that these characters had to embody innocence and naivety, another being that they had to be dynamic in their emotional range (not just happy), a third being that their designs had to be effective at a small and large scale, and yet another still that they had to be simple but interesting to animate. I've become accustomed to drawing economically, as having experienced in previous projects the real need to describe lots with a little, or else suffer the consequences of long turn-overs for frame-by-frame animation. I experimented with a large variety of styles with differing amounts of detail and simplification, all rendered in a similar fashion as it was already determined that the colouring and line style needed to be uniform for ease of animation. I tend to draw most of my more “cutesie” characters with exaggerated features, paying special attention to the mouths since most of the attention of the viewer is either in the eyes or the mouth. The direction ended up being to marry up features from these two concepts, finding a mid ground that would ultimately work. 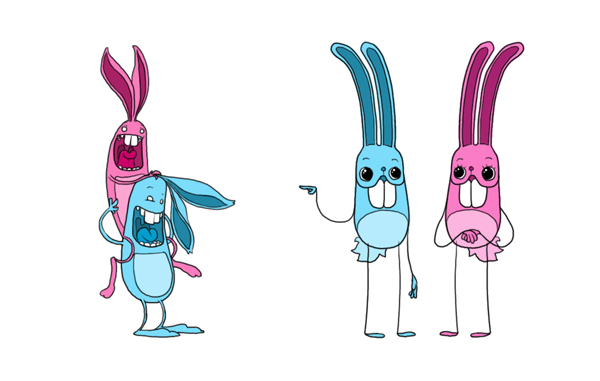 The rabbits on the right were almost there in themselves, but it was thought that the mouths of the concepts on the left were a little more dynamic in emotional range, so we opted for those instead. We also made a point of creating a less-detailed version of the mouth design so as to better serve smaller scale animations. The traditional cute eyes – the overgrown, all-black, shimmering pools of innocence – were the way to go with these two. This would be good to give a range of emotions, as we could enlarge/reduce without losing the ability to express, which would be a little more difficult with smaller eyes. On the other end of the scale, the detail of black-pupil-on-white-eyeball would have been yet another step to be conscious of whilst animating, especially at the smallest of sizes. We also preferred the feet from the left concept, to give a goofier stance to our unwitting heroes. Connect them and the hands to slightly thicker “rubber hoses” for limbs and we've got ourselves a character design! We went through a few more iterations of style-treatments before settling on a thicker outline in a deep blue, not only to make the characters pop in any given scene, but also to soften their details; breaking away from the traditional black-line animation and giving more dimension to otherwise 2-dimensional characters. This little guy is what we ended up with. Note the mouth variant in the smaller scale rabbits. Also note the smallest scale here is generated in pixel-art fashion, like you would a sprite for an 8-bit video game. Once we had established a concrete concept, it was then put to me to create different character emotions, as well as a full character turn-around. From previous experience on other Monkeystack projects, the turn-around was a fun process for me as I'd learned how best to go about it. I had to be conscious of making the right breaks and joints for the very talented Alex to then bring to life, so naming and layer structures were key here, and took almost as long as the drawing process itself.Here's the different angles that would be used to make up the base animations. We will draw bespoke angles and variations as required. I worked closely with Alex and the other monkeys to produce the emotions we would need for different circumstances throughout the Double Happy experience. The idea was that they would emote in both the click sequences and the idle moments, so as to maintain the interest of the user. We were conscious that we had to make them ridiculous and exaggerated, because these little bunnies are supposed to be uncannily happy, it stood to reason that they needed to also be outrageously sleepy, confused, overjoyed, and so on. Hopefully these expressions should be self-explanatory. Along with these was the necessity to have different hand and foot poses and angles, to give the characters some scope of motion. The beauty of the animating process that we've adopted in this case is one of simplicity – draw the image once and push/pull it into submission with After Effects. Time and personnel effective. Hopefully this helps other devs, or even other artists and animators! How do you prepare all of your assets for use? Please share! P.S. - Our new webisode is actually out in the next few days - keep your eyes peeled to our YouTube channel!